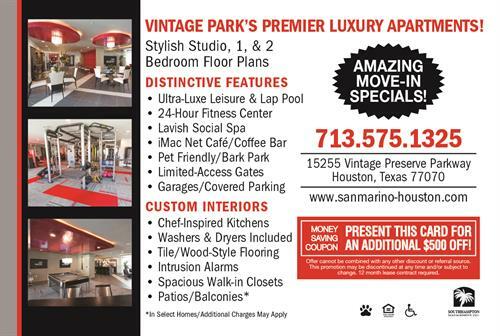 Welcome to San Marino- Vintage Park's newest multifamily community! Built by Sueba USA, San Marino features unrivaled community amenities and stylish, sophisticated apartment homes. At San Marino, luxury and convenience work in perfect harmony. Residents can enjoy the exclusive 24-hour fitness center with aromatherapy towel service, iMac net café, chic social lounge with billiards table, lavish social spa and Starbucks coffee bar. San Marino was designed with residents in mind; choose from one and two bedroom floor plans with walk-in closets, oversized soaking tubs, designer wood-style flooring and spacious patios. The open-concept gourmet kitchens, stainless steel appliances, granite countertops and custom cabinetry provide the perfect setting for private gatherings. 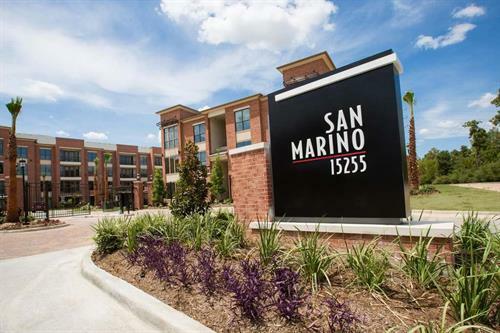 With a convenient location near the most prominent dining, shopping and entertainment in Northwest Houston, San Marino is the perfect combination of suburban luxury and urban flair. 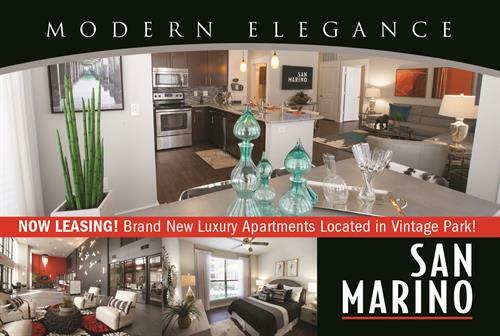 If you are searching for modern elegance in your new home, look no further than San Marino!